As a kid, I wasn’t a big fan of peaches. I didn’t care for the fuzzy skin or the way that I always managed to end up with either a tart and underripe peach or a mealy overripe one. Then, quite by accident, I came across white peaches and my opinion of the peach changed entirely. White peaches (or summerwhite peaches) have lighter colored flesh than traditional peaches and are significantly sweeter. They also can be enjoyed over a larger window of time because they come off the tree quite sweet and don’t need the extra ripening/softening time that yellow peaches do. Although I’m much savvier about picking out deliciously ripe yellow peaches these days, white peaches will always be my favorites and are the type that I used for my summer peach cobbler. This cobbler is very easy to make. It starts with peaches (of course! ), peeled and sliced. I tend to cut my peaches into quite large chunks because they are more tender than, say, apples and don’t really need as long a cooking time. I go for 6 slices per peach for a medium-large fruit. I really like the flavor of honey and peaches together, so I added a bit of honey to the peaches before topping them off. The cobbler dough mixes up in one bowl to a fairly stiff batter. It should be dolloped on top of the peaches to give the dish a traditional “cobbled together” look – hence the name “cobbler”. Hot from the oven and plated with vanilla bean ice cream, this dish really is a taste of summer. 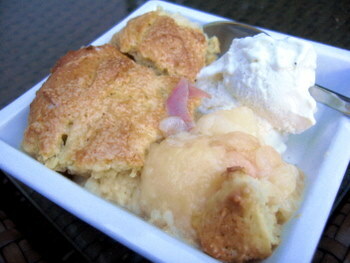 The peaches are so tender that they melt in your mouth and the cobbler gives you a nice base to showcase their flavor. The honey is subtle, but noticeable, in the finished dish, too. Lovely. Because honey can cause baked goods to brown more quickly than sugar alone, you can tent the cobbler with a piece of foil for the last 5-10 minutes of baking time if you feel it’s browning too much. Use a toothpick to test the cobbler dough between the cobbles (the seams, if you will) for doneness before removing the cobbler from the oven. Toss peaches with 2 tbsp honey and place in a 2-qt baking dish. In a large bowl, whisk together remaining 2 tbsp honey, sugar, milk, melted butter, vanilla extract and egg until smooth. Sift flour, baking powder, baking soda and salt on top of sugar mixture and stir to combine, mixing only until no streaks of flour remain. Drop batter, which will be thick, in dollops on top of peaches. Sprinkle with a bit of coarse sugar, if desired. Bake for about 35 minutes, until filling is bubbly and cobbler topping is golden brown. Tent the cobbler with a piece of aluminum foil for the last 5 minutes if you feel it is browning too much. Let stand for 10-15 minutes, then serve warm with ice cream. Next PostNext What is cream of tartar? Perfectly ripe peaches are one of the best things about summer, along with strawberries and tomatoes! I never had peach cobbler until a few months ago when I randomly decided to try one of Paula Deen’s recipes. It was wonderful! Your cobbler looks delicious–I’ll have to try this recipe next! We made this last night. It was delicious. I think I had 6 peaches, but would use about 8 next time. The cobbler dough was outstanding. We served it with vanilla ice cream. I love peach cobbler. This is the first recipe i’ve seen that has honey in it. I think that could work out really well. Thanks for the recipe, I’ve got to try this. Thank you for this recipe. I made this last night with peaches from my white peach tree and it was just perfect! Amy Glaze's Pommes d'Amour – Fresh Peach Cobbler : T’as la PÃªche!